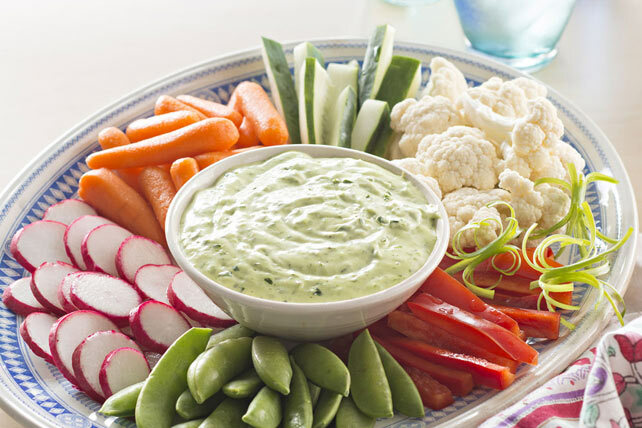 Perfect for entertaining, our classic Green Goddess Dip is made with fresh parsley, green onions, MIRACE WHIP, ranch dressing and a touch of lemon juice. Add next 4 ingredients; blend until smooth. Cut 3-inch piece from each reserved green onion top. Use sharp knife to cut both ends of each piece into thin strips, cutting almost to, but not through, centre of piece. Place onions in cold (not ice) water. Let stand 30 sec. or until ends start to curl. Drain, then use to garnish plate of vegetable dippers. Prepare using Kraft Calorie-Wise Rancher's Choice Dressing.